I love it when I see a company named B & B. (You can read why here-> B & B ). I don't care what product or service they are hawking; I'd buy it just to have the B & B label. I noticed the B & B Promotions in the address and got all happy. It was hard to see the address amongst all the Wal-Mart logos and smiley faces. Looks like the B & B Promotions hooked themselves up with a huge retailer. Of course, B & B is all about hooking up. "Some restrictions apply. Must be a homeowner to participate. Not affiliated with Wal-Mart." So, basically, this is a scam of some sorts. I’m sure you call the 1-800 number and they will try to sell you insurance or a water purifier or a water purifying insurance policy. I could give two shits about Wal-Mart, but this "Promotions" company is tainting the proud history of the letter B ampersand letter B. 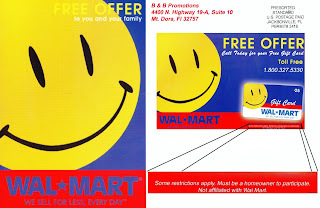 So, I am forwarding on a scan of the postcard to Wal-Mart suggesting they do something about this company that dares take the name of B & B in vain.